Meanwhile, this legislation requires the production of reports on North Korea cooperating with Iran (a supreme international crime, as everyone knows), and abusing human rights (something never ever done in Guantanamo, Chicago, or Riyadh). What actually drives these sanctions? 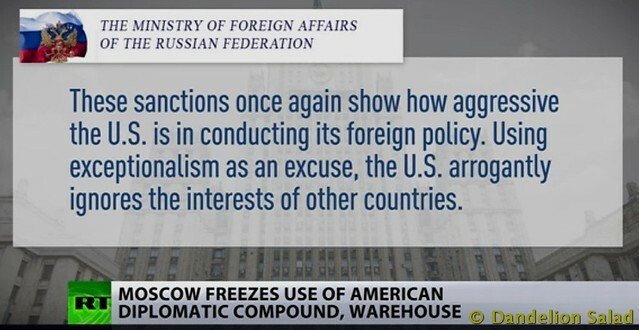 As I discussed earlier on this site, and this week on Russian television, [see video below] sanctions are acts of aggression aimed at selling weapons, preparing the ground for war, responding to successful propaganda, advancing economic interests, and distracting the public from government abuses it might object to. Of course U.S. sanctions against North Korea for 67 years, Cuba for 57 years, and Iran for 38 years have only strengthened the control of those in power in those countries — and the same effect is documented now in Russia. But sanctions led the way to all-out war on Iraq and may now serve that purpose in Iran. Intentional total war with North Korea or especially Russia is less likely because of their nuclear weapons. But these designated enemies are very useful to the weapons industry nonetheless. All quite true, but all extremely minor concerns. David Swanson is an author, activist, journalist, and radio host. He is director of WorldBeyondWar.org and campaign coordinator for RootsAction.org. Swanson’s books include War Is A Lie. He blogs at DavidSwanson.org and WarIsACrime.org. He hosts Talk Nation Radio. He is a 2015, 2016, 2017 Nobel Peace Prize Nominee. War Is A Lie: Second Edition, published by Just World Books on April 5, 2016. I’ll come anywhere in the world to speak about it. Invite me! The Republican-controlled Congress can’t unite around Trump’s legislative agenda, but with Democrats they are in unison when it comes to punishing Russia for alleged meddling in the 2016 election. Russia will brush off new sanctions as it did three years ago, but the Europeans won’t. CrossTalking with Mitch Feierstein, David Swanson, and Alexander Mercouris. Moscow has told the US to reduce the number of its diplomatic staff in Russia to 455 people, and is also halting the use of embassy storage facilities in the capital, according to the Russian Foreign Ministry. Congress Unites on Russia Sanctions, But at What Cost? As the House overwhelmingly backs new sanctions on the Kremlin, Russian lawmakers vow a “painful” response and the European Commission mulls retaliation of its own. This entry was posted in Anti-war, Congress, Imperialism, Iran, Oil and/or Fossil Fuels, Republicans, Russia and tagged Crimea, David Swanson, Economic Warfare, North Korea, Russiagate and/or Russophobia, Sanctions, Ukraine, Vladimir Putin. Bookmark the permalink. Aaron Mate, and the Real News, is slipping, slipping, slipping. Then again, the Left everywhere is slipping. But there are many genuinely independent progressive investigative journalists out there. So if you must tap George Soros-funded (ugh!) Alternet and deep state-connected Seymour Hersh, et al, fine (Hersh’s limp comments about the White Helmets should clue you in), but also listen to those other ‘independents’ voices (who are often first with the facts that celeb journos later cite and get all the credit for) and let us listen to them, because, frankly, they are more trustworthy. Mate’s comment that the situation in Ukraine (and therefore Crimea) is more nuanced than simply ‘Russia did it’ made me cringe. No, Aaron. It’s not more nuanced. It’s exactly the opposite of what the spittle-flecked monsters in Washington and Congress say. Got that! No argument from me, I totally agree with you, Arrby. I cannot write well, but I am a pretty good editor. It just jumped out at me while reading your post. My readers do the same thing for me when I miss something. I’m always grateful as I’d prefer to have the post be accurate. It’s a bit easier for me as I’m not the original writer so haven’t looked at it as many times as the writer has done while composing their piece. The typos generally stick out. Glad you didn’t mind me pointing out the typo in your article. There’s Volker Treier, chief economist of Germany’s chambers of commerce, saying, in effect, ‘We don’t give a crap about others who uncle Sam burns, but we care when it’s us’. How nice! “Much of the “punishment” of Russia for these supposed crimes is clearly driven by economic competition.” In other words, the US only wants competition that others can’t win in. And here we see the number one way that the US, and any lawless and unprincipled state or person gets ahead and on top in this dark world, namely via rule-breaking. When we follow the rules that we all agree on, those who strategically break them – which is what the sanctions we are talking about here – come into positions of power while the law-abiding (‘sucker’, from uncle Sam’s standpoint) states lose. Thank you David. A well thought out piece. Glad you liked it, Zachary. But how is it possible for Congress in near unanimity to pass such a complicated and dangerous bill with major US corporations opposing it? These sanctions not only threaten, Russia, Iran and North Korea, they threaten the firms of Europe. What power source is in favor of it to the point of greatly increasing war tension on basically fraudulent issues. Would it be Israel, to attack Iran? The banksters to increase the military spending? The military? Are the confused American people in favor of it? The neocons are of course, but how did they get the neoliberals to support it? These questions are crucial because the response and counter response may lead to war. Who wants war over these non-issues?